1. Never run your laptop off battery. The processor runs slower when on batteries, making it more frustrating when trying to control the laptop, find the right slides etc. And, of course, it can run out of power. 2. Turn off all power saving features. Set all settings to “never”. This is because there may be a considerable time interval between you setting up your computer and you actually taking the stage. You don’t want to wait a couple of minutes while the computer wakes up again. 3. Turn off the screensaver. It is very distracting if you are speaking on an important topic for a few minutes only to have your holiday snaps appear on the screen behind you. 4. Turn off wireless networking. Actually, turn off any program that might come up with a prompt or warning unexpectedly, such as virus checkers, wireless networking, Windows update, email programs, chat programs etc etc. 5. Clear off all icons from the desktop. In general you should never display the computer’s desktop to the audience, but just in case, remove all evidence of the programs you use and files you leave lying around. 6. Know your slide numbers. Have a print out of your presentation, including slide numbers. You can jump to a specific slide by entering the slide number and pressing <ENTER>. This allows you to show exactly the slide you want without having to scroll backwards and forwards through the whole show. This is particularly important if you are answering questions from the audience and may have skipped some material earlier. 7. Have a blank slide in your presentation. When you want the audience focus to be on you, not the screen you need to be able to turn off the projector. If the projector is at desk level, it might be easiest to put a book in front of the lens to block the output. Alternatively have a slide that is completely black in your Powerpoint show. Jump to it by typing the slide number and pressing <Enter>. 8. Make sure your slide master is small. If you have a large graphic or photograph on your template then it will be copied to each slide. This can make the presentation ve large – difficult to copy / email and slow to display. Keep the master slide very simple. 9. Do not link information from other programs. Powerpoint has sophisticated methods of linking to live data in spreadsheets, databases web pages etc. Keep things simple by copying the data you want to use to your presentation so that you do not have to rely on other programs working when you are presenting. 10. Keep a copy of your presentation on a memory stick. It may happen that you can’t use your own laptop for a presentation and need to load it on to someone else’s machine. Keep a copy of the final version on a memory stick for easy transfer. If you are using the latest version of Powerpoint you should also save it in the previous version, as the other laptop may not be able to read it. Use the Pack & Go function of Powerpoint to make sure all logos and fonts get transferred as well. If possible take a CD copy as well : Windows XP and Vista should connect to a USB stick automatically, but old Windows 98 computers probably won’t. 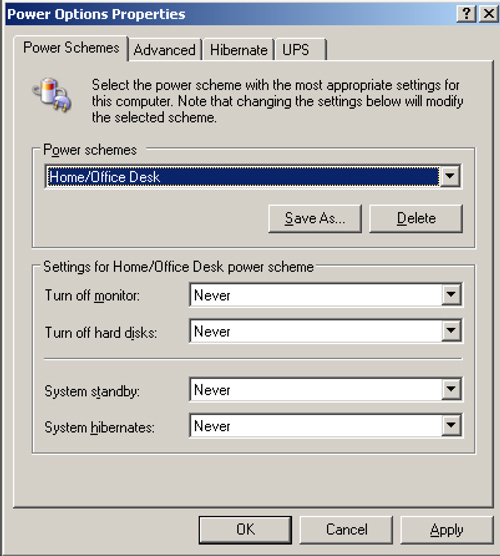 In some instances when connected to a network, XP and Vista also have trouble with USB devices. 11. Understand your laptop. There are in general two ways the laptop can treat a projector display : either it makes the projector display exactly what is on the regular screen, or it uses the projector as an extension of the regular screen. Both methods have advantages, and you should know which one you are set up for and how to swap to the other. You also need to know how to turn on and off the projector output from the laptop – usually a blue function key and <F5>. You may need to reboot your laptop after connecting to the projector. 12. Never use sound in your Powerpoint. It is unusual for a conference venue to have the correct cables at the podium to connect to the speaker output of a laptop. If you are able to connect up for sound then it is essential to check the sound level before the show starts to make sure that your sound will come out at the right volume. It is also very easy to introduce earth loops that will cause a background hum from the audio equipment when the laptop is connected. 13. Bring your own connectors. Particularly if you use a Mac or very small sized PC laptop with non-standard connectors for video output. Most likely the venue will have the projector ready to connect to the standard PC 15 pin micro-D connector. Bring whatever it takes to have your laptop fit this standard. 14. Don’t change your slides. It is tempting to change or add information in your slides just before presenting. As this is probably a stressful time, mistakes are particularly likely. It may also upset slide numbering. It IS possible to use Powerpoint well in a presentation, but it is not easy and requires a lot of practice, plus time to setup and check before you take to the stage.